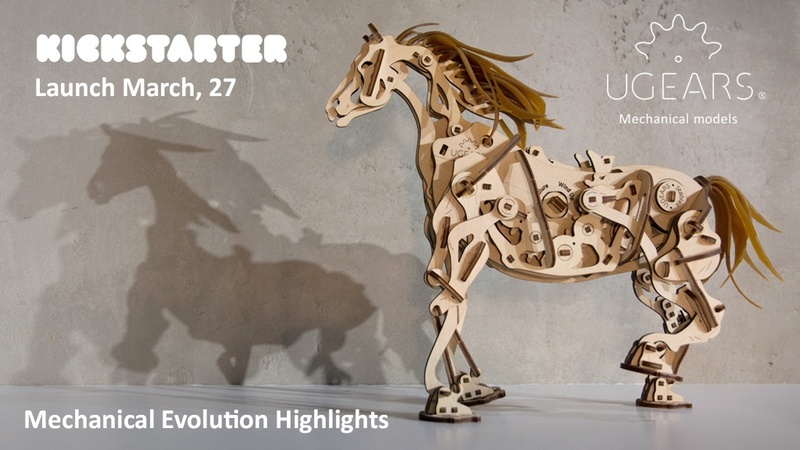 Ugears continues to explore the mystery of mechanics and this March exclusively on Kickstarter presents the fascinating range of 12 absolutely unique models inspired by historical mechanisms from the Middle Ages to nowadays: The Horse-Mechanoid, the Archballista-Tower, the Tower Windmill, the Stagecoach, the V-Express Steam Train with Tender, the Trimaran Merihobus, the Roadster, the Aviator, the Bike, the Heavy Boy Long-Hauler with the Trailer, and the Flexi-Cubus. They are ready to become your companions in an exciting adventure through the ages on the way to discover the evolution of mechanics. Let the Mechanical Journey begin! 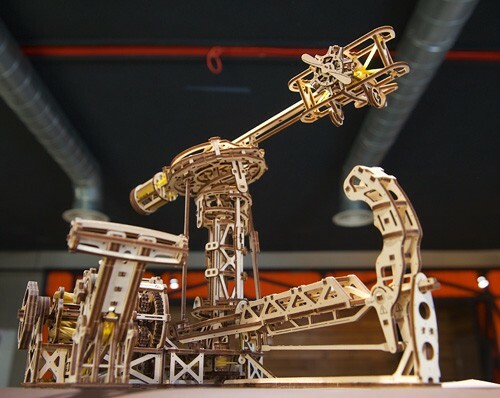 Each UGEARS model is not just a construction kit but an incarnate IDEA of a PERFECT mechanism. Putting them together, you bring the idea to life. 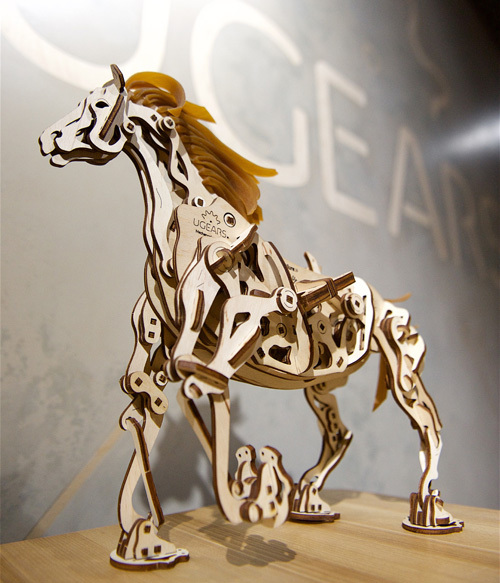 Ugears Horse-Mechanoid – a unique assembling model that joins nature and mechanics. In walking mechanisms designed by many engineers before balance was realized by means of additional extremities or other extra-supports. Ugears designers paid special attention to the anatomy because it was important to make our Horse quadrupedal. And we FOUND a smarter way to achieve stability in motion. The innovative mechanism of this beauty makes the Bionic Horse a real walking quadruped. All the joints and movements closely resemble those of a real horse, but powered by rubber bands, gears, cranks and gravity. The bionic heart of your horse is a pendulum installed in the chest of the mech. The oscillations of the pendulum slow the transmission of energy from the rubberband motor to the movable elements extending the working time of the mechanism. 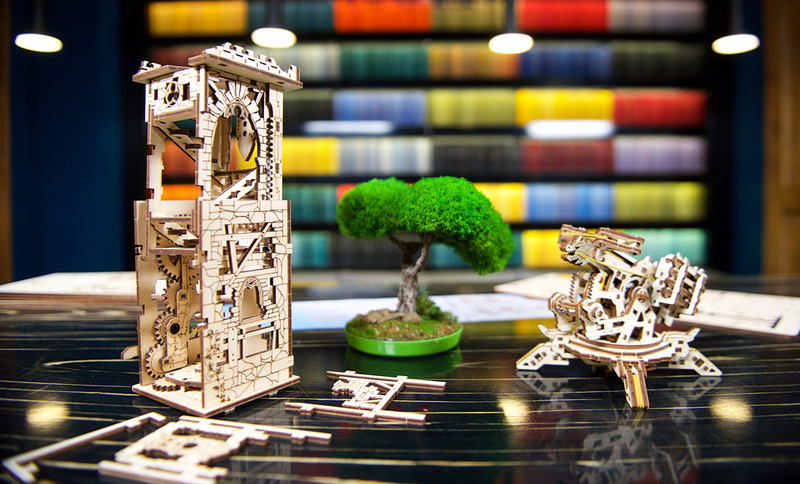 Fully assembled, the Ugears Archballista and Tower has moving parts and elements that will help you to recreate a medieval siege and test your great conqueror’s skill. The firing mechanism – or the actual archballista can shoot up to four wooden bolts in a round. Decorated with delicate ornaments, a classic ivy-cloaked castle Tower with a heraldic gryphon/dragon on a coat of arms hides a few interesting constructional features. 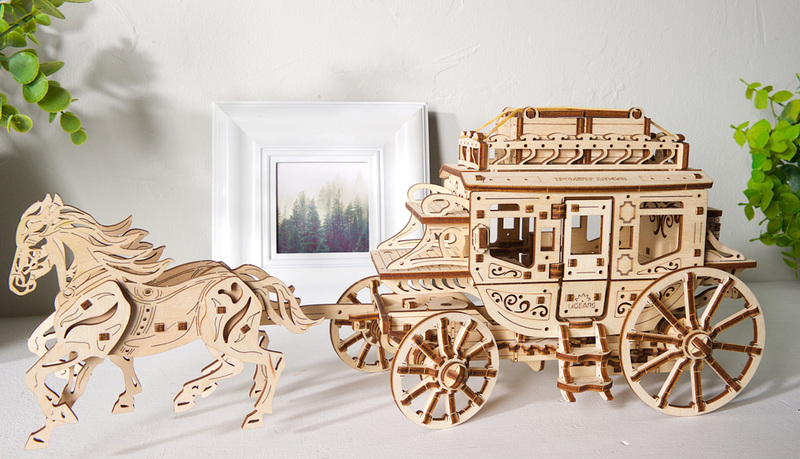 The Stagecoach brings an unforgettable time of working together, re-creating the Wild West spirit with your own hands. Simple and comprehensive mechanics guarantees fast but interesting assembly that people of any age will enjoy. The Stagecoach is fast and needs just a few turns of the winding key to get going. 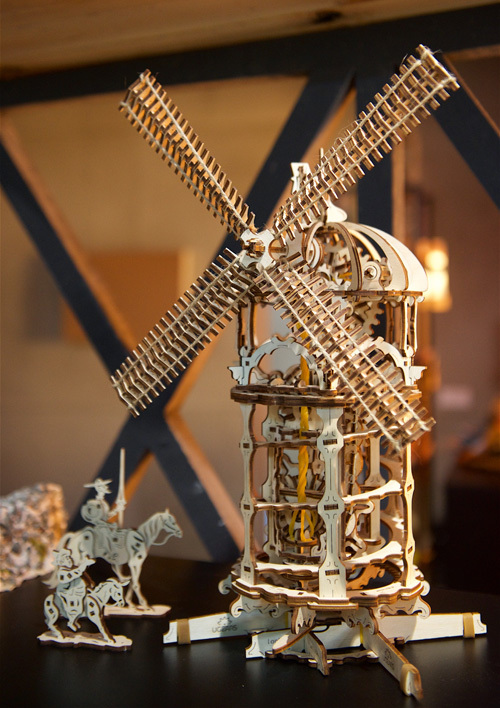 Inspired by the earliest tower mill in England, the Ugears Tower-Windmill model has a unique mechanism inside with a full-fledged chain drive made entirely of wooden materials. When spinning rapidly the aerodynamic twist sails create fairly strong wind. It also can work the other way around: blowing air directed at the sails will make them spin. Use a fan to demonstrate to your kids how real windmills operate. The rotation of the windmill sails is mesmerising. You can’t stop watching them turning over and over. New and exciting Ugears V-Express Steam Train with Tender. The minutely detailed the Victorian Age design of the model reveals the beauty of moving details: gears and a flywheel, and the workings of the cylinder-piston arrangement, the ladder and the fire hole with the door you can open. Assembling the Ugears’ V-Express Steam Train with Tender you will feel like an inventor engineer discovering for the first time the magic of the complex mechanism taking shape in your hands. Wind it up – and full steam ahead! Carried by the wayward wind of travel, the graceful and stylish Trimaran Merihobus from Ugears invites you to leave your peaceful harbour and sail away on an exciting marine mechanical adventure. 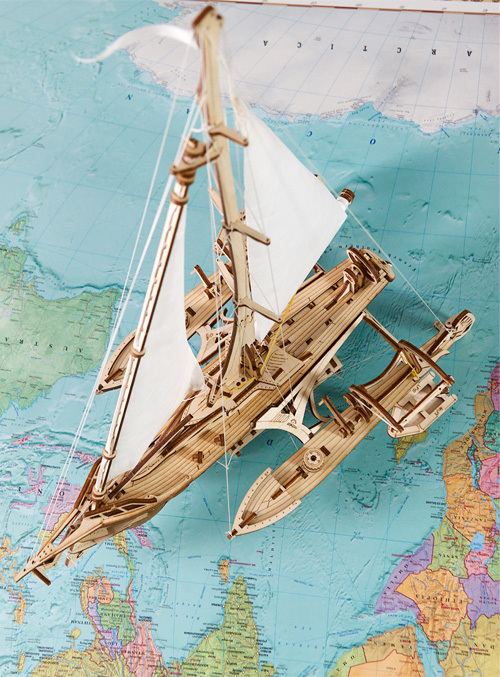 The new mechanical bench model kit has everything you might need for assembly (including winches, rigging and hulls) and requires neither glue nor special tools to be fully assembled into functional working sailboat. The unique charisma of the Ugears Roadster comes from its detailed realistic retro-design and a powerful V8 engine. The clever combination of the plywood elements of different thickness – 4 and 2 mm – ensures that the roadster’s body looks streamlined and clear. Do you fly in your dreams? Grab the wheel, become airborne and Come fly with the “Aviator”, the first ever aircraft model from Ugears. The flight control tower bars regulate the speed, and the roll and pitch of the airplane or helicopter. Wind it up - and you are ready to soar into the sky. The Ugears Bike carries the true spirit of the road. It’s always been and will forever represent a challenge, speed, and true freedom. 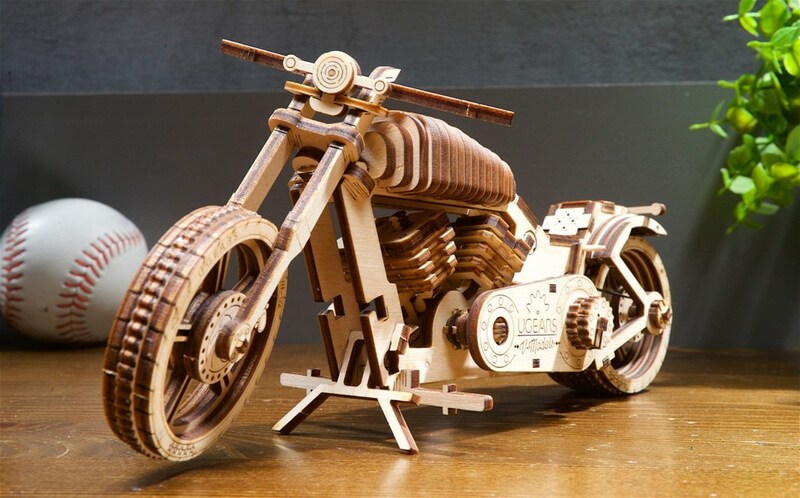 The Bike is driven by a powerful rubber band motor makes the motorcycle ride for as much as 3 meters in one winding. The energy is transmitted by a belt drive to the mechanism. Fill the tank to the brim and venture forth with Ugears’ Heavy Boy Truck VM-03 to explore new routes. Richly detailed, robust and powerful the Ugears long-hauler has a V6 engine driven by a rubber band motor. With one winding, the truck can go for about 5 meters. The transmission system implemented in the model has three modes: forward, back and idle. 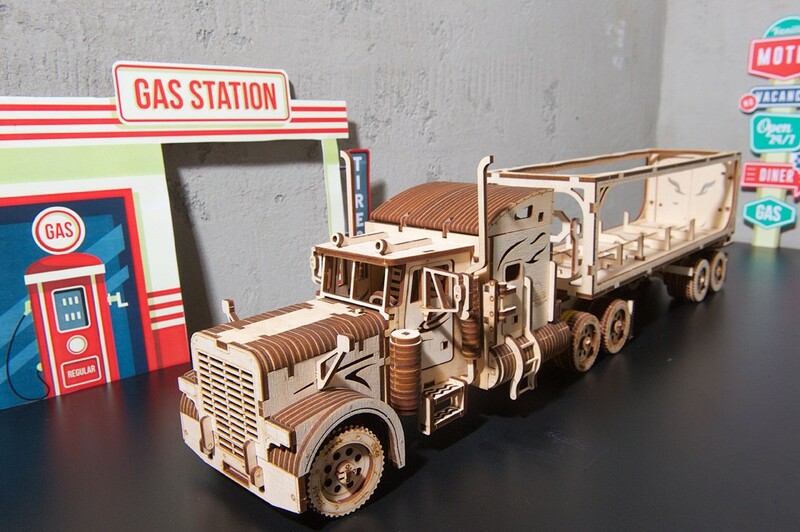 The detailed design includes all iconic elements of a long-haul truck – two big pipes and two pairs of mirrors as well as a realistic hook up system that connects your tractor unit to the trailer. Heavy Boy Trailer Truck VM-03 can carry your favourite things, it will deliver a box of chocolates, a load or fruits or even a ship in a bottle. Use an automated conveyor to load your trailer with potted plants and you will have an absolutely unique wheeled garden in any interior. Mechanical time travel doesn’t have to end in the present. Ugears’ designers decided to fantasise about future mechanics and invented the Flexi-Cubus. The Flexi-Cubus is a mechanical anti stress puzzle in the form of a steampunk skeleton cube made out of eight joint-connected spheres. 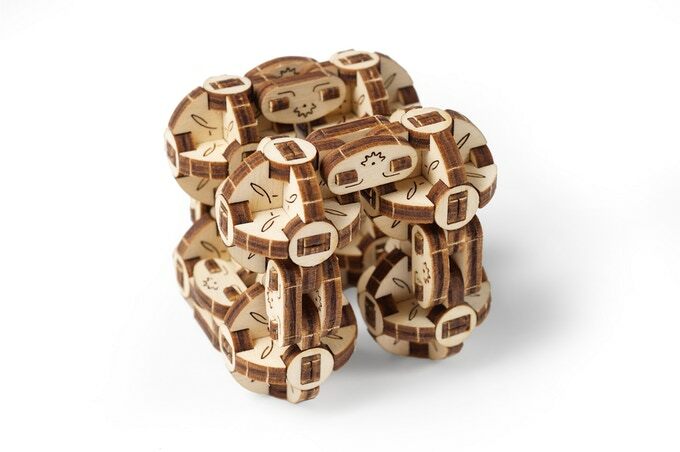 This flexible connection allows the spheres to move and roll over one another creating different geometrical shapes as many times as you want. Each sphere is a mini-mechanism comprising six segments connected with a hinged joint. UGEARS is a company based in Ukraine with its own production facilities that invents and produces unique mechanical models. Some of the designs are inspired by real-life prototypes while others represent an original re-imagining of historical mechanisms. Perfect examples of unique engineering, our models adhere to the highest level of quality production standards. Ugears’ mission is to give an unforgettable time of working together on things that are popular for all ages. We want family members and friends have fun bonding while creating. And as a result — to get revived mechanical marvels. 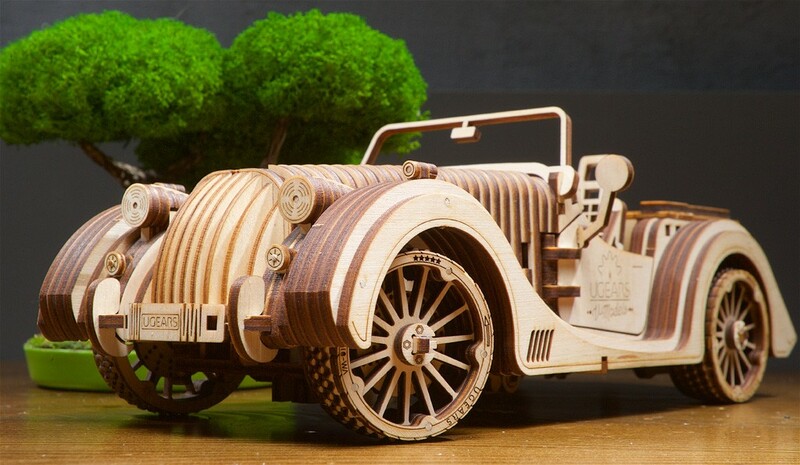 All Ugears models are made of sustainably sourced wood and require neither glue nor special tools to be fully assembled into functional working models. Also, there is no need for batteries or any external power source as they are powered by rubber bands, gears, cranks and gravity. Each model kit has everything you might need for assembly. 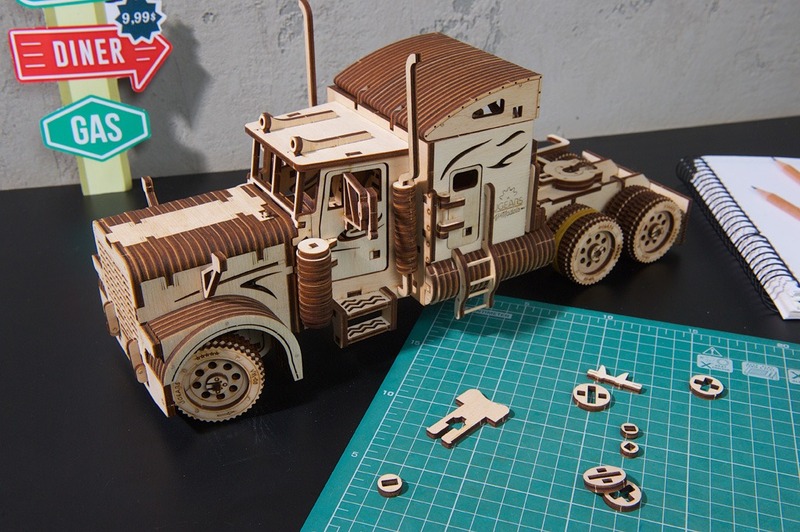 The quality of the parts is very high – a laser method is used for cutting items from a plywood board. All steps of the assembly are described in step-by-step color instructions in 11 languages. 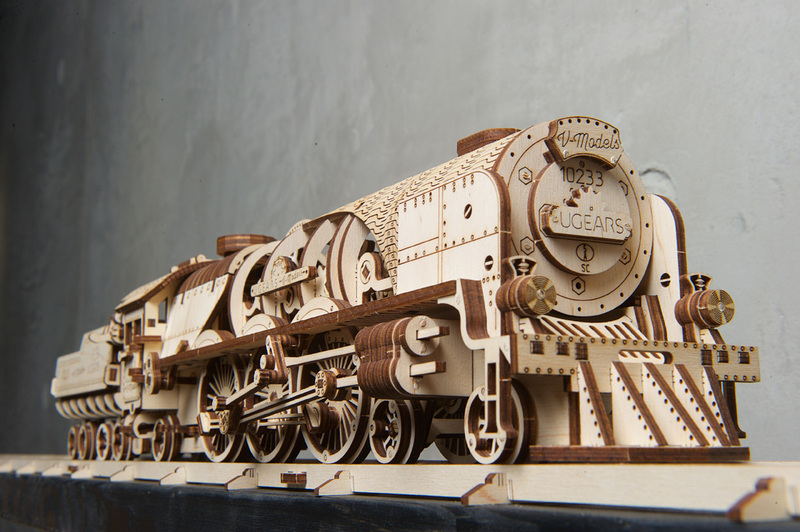 Today, The Ugears mechanical models have become an interesting and engaging activity, a smart hobby, an original gift idea that brings hours of fun, and the joy of being creative, making things with your hands with friends and family in over 85 countries across 5 continents. Feel free to contact us if you’d have any additional information, hi-resolution video and photos.